Multiplex operator Inox Leisure has become the official partner of Indian Premier League (IPL) team Rajasthan Royals. Under the partnership, Inox will have its logo presence on the team attire during the Indian Premier League (IPL) 2019. The strategic partnership with Rajasthan Royals will lend a touch of royalty and offer its patrons an extraordinary experience beyond cinemas. Rajasthan Royals have relaunched themselves in their new colour Pink with first Royal, Shane Warne as its brand ambassador. 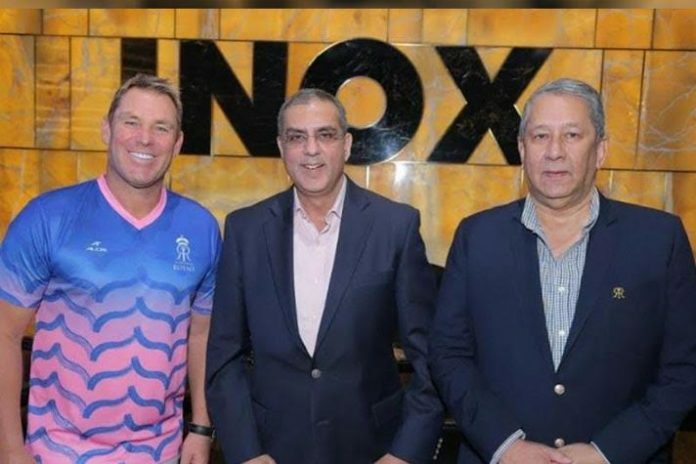 The Jaipur-based franchisee has also in association with Inox has also launched a contest for their fans for the IPL 2019. The cinema exhibitor has introduced a special offer for its guests across the country enabling them to win a free trip to Jaipur to watch a Rajasthan Royals match during this year’s IPL. Inox viewers will have to book their movie tickets through Inox’s mobile application or through its website inoxmovies.com in the month of March to be eligible to win the all-expenses-paid trip to Jaipur. Those guests buying a Rajasthan Royals Popcorn Tub will also be eligible for winning the coveted trip. Along with free match tickets, Inox will offer free return air tickets from their place of residence, a 2 Nights-3 Days stay and sightseeing at Jaipur to the winners. The eligible viewers also stand a chance to win the Rajasthan Royals jerseys, autographed merchandise and an opportunity to meet the Rajasthan Royals players.